While many applications require springs that dampen force and perform a pushing action, others require springs that oppose extension by pulling themselves back together. Extension springs, also called tensile springs, are found in many applications, such as a common household stapler, snow plows, garage doors and various types of spring tensioning devices. Helical extension springs do not normally have set removed. Furthermore, unlike compression springs, extension springs do not have a solid stop to prevent overloading. For these reasons, design stresses are generally lower for extension than compression springs. A special type of extension spring, known as a drawbar spring, has a solid stop. It is essentially a compression spring with special hooks. 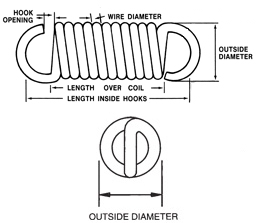 Diamond Wire Spring company is your source for custom extension springs. springs in stock and can also handle most custom spring projects.